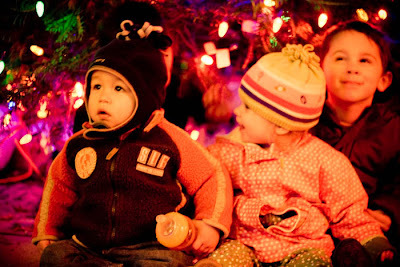 Last year we braved downtown Portland for the big tree lighting. It seemed doable given that one child was immobile and we felt we could contain the other. 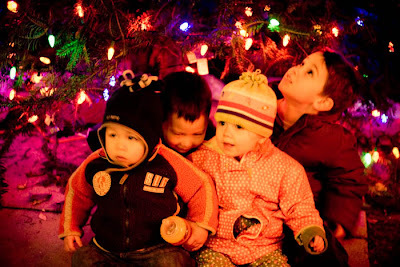 It was fun, but not something we felt comfortable tackling this year so we tried something new and attended a tree lighting in a local neighbourhood… well, almost. We were actually eating dinner in a restaurant next door when they flipped the switch. Never mind, though. 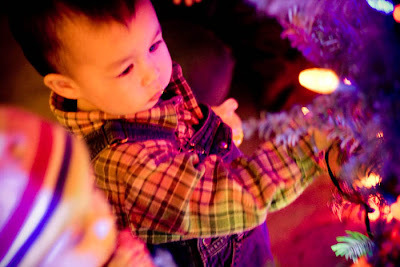 Apparently the outlet was easily accessible to children so a toddler managed to switch the lights off a little later in the evening and we were able to experience the tree lighting all over again. 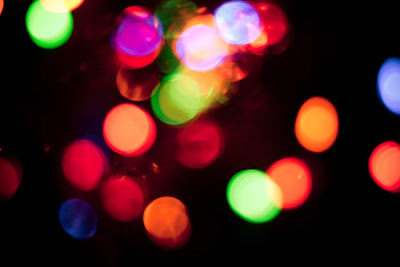 But, just like last year, I was able to get a bunch of blurry, Christmas tree-illuminated photos. The only difference between this year and last was that the tree was a little smaller and we were surrounded by lots of great friends. 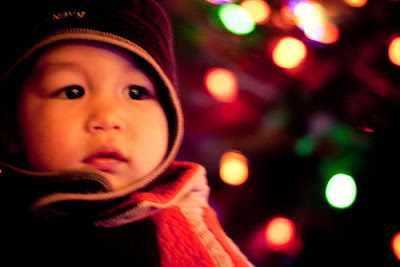 Oh, and that apparently my oldest child was having far too much of a good time to stay still for many photos. 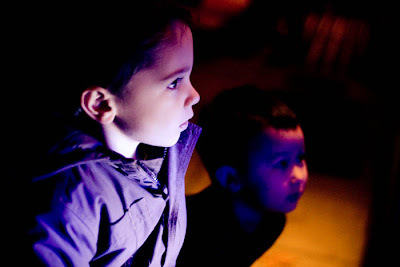 Here he is checking out some lights in a pet shop window with his friend Liam. I don’t think they were even Christmas lights. And my attempt at a group shot. I waited too long – some of the kids had already left and one was overtired and not interested in having her photo taken. This was the beginning of our Christmas celebrations. Coming up next, a ride on the Polar Express – really! This entry was posted in Family, Motherhood, Samuel, Thomas. Bookmark the permalink.